Put on a shirt you old, out-of-shape Jackass! Some guys feel compelled to walk around with their shirts off. It’s weird. Frankly I just don’t get it. The truth is the overwhelming majority of guys look simply terrible without their shirts on. The fat, the patches of hair, sweat, tattoos, and best of all scars! Add to that the effects of aging! 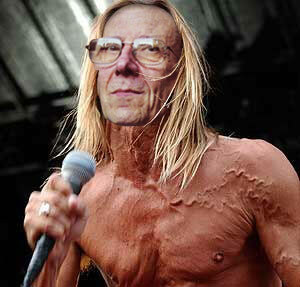 Even the seemingly ageless Iggy Pop has started to look bad. So too has Sting. Sting, obviously the smarter of the two, has realized this and keeps his shirt on through the entire concert (most of the time). BTW – it should be a rule NO ONE over a certain age can go shirtless. That age should be, at most, 25. Let’s face the scientific fact that only about 1% of the male population ever looks acceptable without their shirt on in their entire life! That is on their best day ever! The day they graduated from basic training or ran a marathon. Even then it’s a maybe. I’ve seen some marathon runners without their shirts on. Bad idea. So unless you are under 25 and coming off a combination of workout/diet cycle and weekend stomach flu – or your are Mathew McConaghey – keep your shirt jackass. Next post: Hang up or order you Jackass!